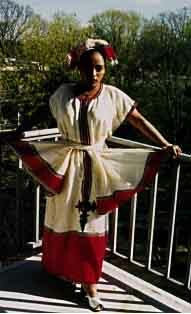 I'm going to tell you about Ethiopian traditional dress. In Ethiopia they have a distinctive style of clothes. The women's styles are very colorful. Their dresses are made of cotton and the women make them at home. Each dress has it's own design. The women wear long necklaces and also something like bracelets on their feet. The bracelets are made of gold and silver. They usually wear bracelets on their arms made of gold, silver and ivory. The men usually like to wear green, yellow or red because it stands for the flag of Ethiopia. They wear a hat which looks like a cowboy hat. It is made from a special material. They usually have a tail made from horse hair in their hands. We wear Ethiopian traditional dress in holiday times and during Sunday church However the last 40 or 50 years some have changed to a western style dress. But in the countryside some of the conservative Ethiopians still wear the Ethiopian traditional dress. Even in the United States during the church time, many Ethiopians still wear the traditional dress.